Matt Adams - Superheroes, Sci-Fi, and a Touch of the Fantastic: A pitch contest...why not? One of the biggest barriers I've had to overcome in my time as a writer is my stubborn tendency to keep everything to myself. My work is my work...sometimes I feel like I don't want to share it with anyone. "So, how is anything ever going to get published, dear sir?" I ask myself. Writing is a solitary practice that's really a team sport. It's baseball...a game focused on individual match-ups that can't be won without teammates. So, hey, getting "out there" is a step. I've done a little bit of it and am becoming more active on boards and blogs and Twitter. Tonight-slash-this morning, I'm entering a pitch contest on YAtopia. 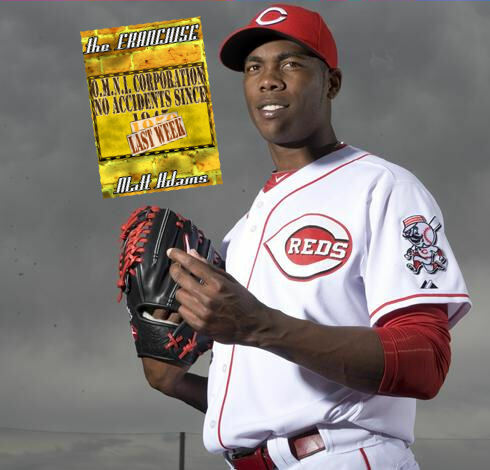 Let 'er rip...with a little help from our friend Aroldis Chapman. Now this is how you pitch a book!